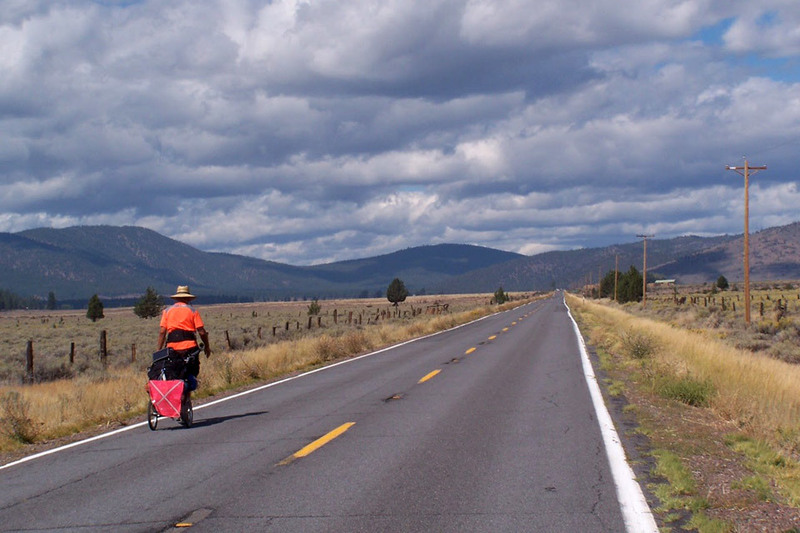 Due to a back injury, sixty-five-year-old Ted Stekkinger was unable to carry a backpack to complete his dream of trekking the Pacific Crest Trail to Canada, so he decided to trek with his Wheelie Walking Trailer along alternate routes, aqueducts, and trails, from his home in Ventura, California, to Canada. He completed his goal in the summer of 2015 after trekking 1,435 miles (2,309 kilometers), camping most of the way. In May to June, 2016, he trekked the Camino de Santiago from Saint Jean Pied de Port, France, to Santiago, Spain, 500 miles (805 km), with his Wheelie. Then in September to November, 2016, shortly after completing the Camino Francis, he trekked the Camino Via de la Plata, from Sevilla, Spain, to Santiago, Spain, 630 miles (1,014k), with his Wheelie. And in February 2019, he has started his trek from the bottom of the South Island to the top of the North Island of New Zealand, with his Wheelie of course.